Bohemian refers to the residents of the Kingdom of Bohemia, now known as Czech Republic. The French refer with the term bohemian to the gypsies, as they thought Romani people came from, or entered the West through Bohemia. A bohemian can be a socially unconventionally person, often involved in the arts. The original "Bohemians" were travellers or refugees from Central Europe. The British Romani people were using a vardo as their home. Vardo also called living wagon, van, and caravan. The vardo was very popular from the mid-1800s through the first two decades of the twentieth century, roughly 70 years. Coach builders, specialised in building a vardo, would get the commissions by families or by newlywed couples. It would take between six months to a year to build a vardo. Vardos can be categorised into six main styles; Reading, Ledge, Bow-Top, Burton, Pop-cart, and Open-lot. A wagons' exterior was elaborately decorated, hand carved, painted in bright colours, decorated with traditional Romani symbols, details accented with gold leaves. Incorporated in the carvings were aspects of Romani lifestyle, such as horses and dogs, as well as decorative designs of birds, lions, flowers, vines. The interior typically has built-in seats, cabinets, a wardrobe, bunks in the rear of the caravan, and a china cabinet with glass doors. During the wagon time, in the 19th and 20th century, Romani would burn the wagon and belongings, as part of the funeral rite after the owners death. Bohemian style is not a trend, it is a way of living: unconventional, free-spirited, artistic. Bohemians have been known as being carefree, they know the art of lounging. Time to unplug from all the distractions of modern society, time to get inspired. Those who like the bohemian style are non-bourgeois, travel a lot and/or collect furniture, accessories, art, decoration from all over the world. A house will not be decorated in one time, it "grows" over the years. Furniture is collected, often vintage or ethnic pieces, they have a story of their own. Bohemian style is perfect for summer: it is romantic, it reflects freedom, optimism. There are no rules to follow: you can make surprising combinations with a mix of patterns, colours, and styles. Colourful floor cushions lend a summer bohemian feel to outdoor spaces. 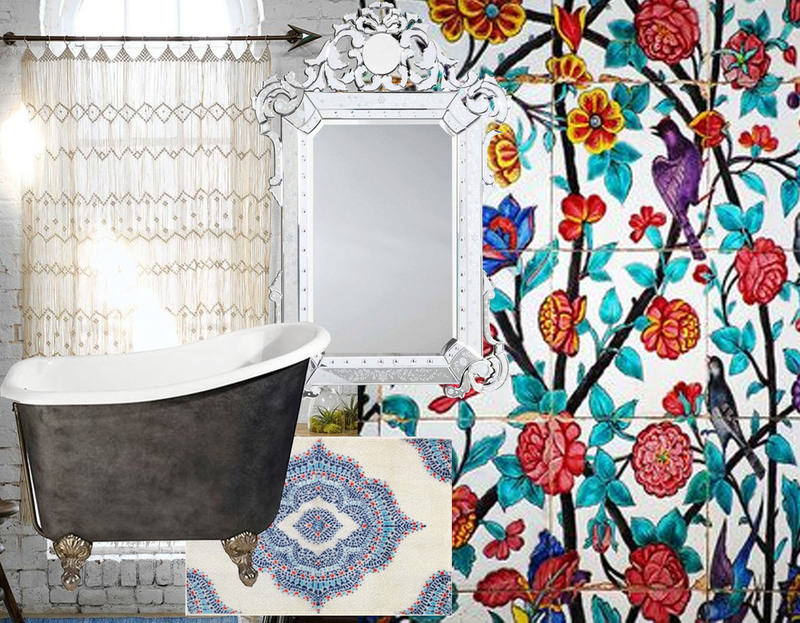 What can be nicer than, when taking a bath, to be surrounded by hand-painted tiles, glamorous mirrors, handmade accessories, candles, artwork. A crochet curtain or macrame wallhanging will give a chic twist to the room. Every piece is telling the story of the people living in the house. Bohemian style was kind of a trend in the '70s. A simple bathroom can get a twist with a hand-painted washbasin. Think out of the box: this style has no rules to follow. A minimal bedroom can get a bohemian touch by adding a wallpaper, embroidered pillows, an exotic looking armchair. Combine without fear flowers and stripes, a crystal chandelier will give the room a precious and glamorous touch. 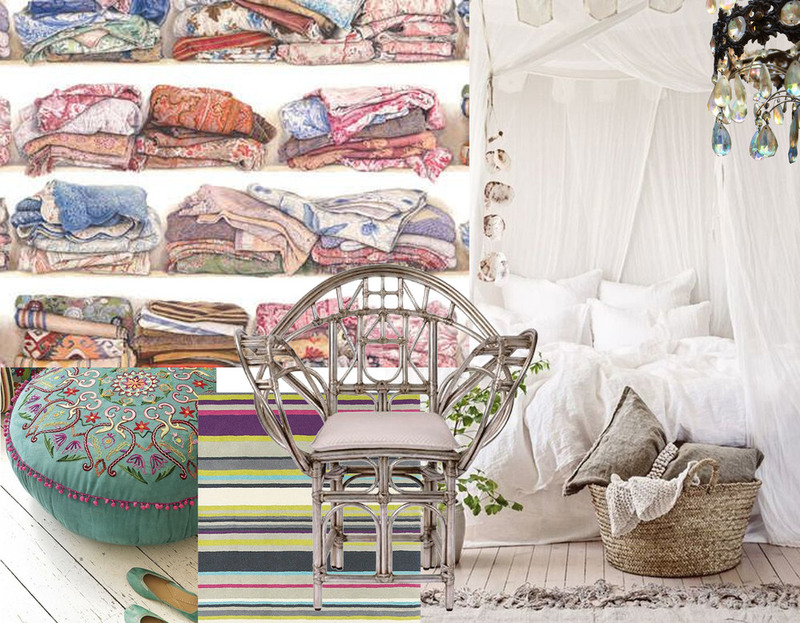 Chic meets boho, sit back and relax like a hippie in a comfortable home, cluttered with beautiful and interesting things. You want to give a fresh touch to your interior: bohemian style is the perfect choice for summer.